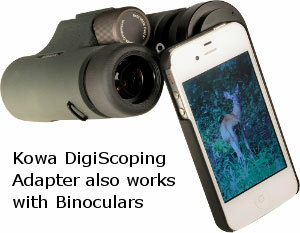 Kowa Sporting Optics now offers a DigiScoping adapter for the iPhone 4 and 4S models. 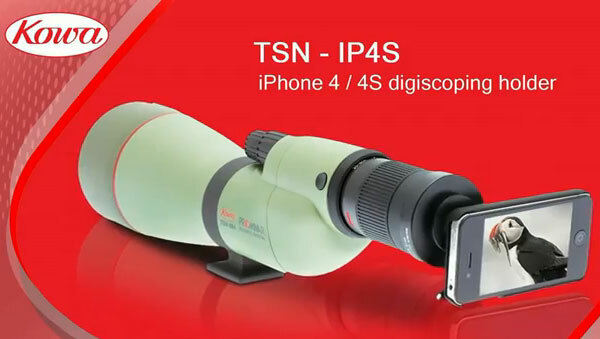 Kowa’s TSN-IP4S iPhone adapter comes with two standard rings, one for the 880/770 series scopes and one for the BD/SV/YF series of binoculars. Similar in design to Meopta’s Digiscoping adapter released last year, the Kowa product holds an iPhone securely and attaches to the rear ocular of a spotting scope (or binoculars) using a cylindrical sleeve (aka lens ring). Crafted from aluminum, the precision-fit Kowa lens rings are coated with a soft material so they won’t mar your eyepiece(s). The Kowa adapter comes with two standard rings, one for the 88/77 series scopes and one for the BD/SV/YF series of binoculars. Additional adapter rings for the Genesis 33 and 44 series of binoculars and TSN 660/600/82SV spotting scope eyepieces (except long eye-relief eyepieces) and 21x, 32x, and 50x High Lander eyepieces may be purchased separately. The lightweight adapter is made of an epoxy resin material that will not damage the finish of your iPhone. For more information, visit the Kowa’s Digiscoping Webpage. Watch the video below to see how the Adapter holds the iPhone on spotting scopes. Share the post "Kowa Now Offers Digiscoping Adapters for Spotters and Binocs"
How about a few different models for those of us that aren’t with the hip Apple crowd? There are more Andriods than Apple phones out there after all. I’d like this ability with my KOWA and my Android. Looking for an adapter for Swarovski scope and Evo 4G Android cell phone.